Selling Online in just 1 Day! Want to get your internet business running in just 8 hours? Join our hands-on workshop and bring your laptop to start learning internet marketing tools you need to create your online business and manage it without paying any advertising fees! 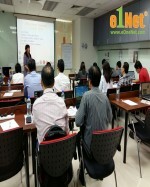 What topics are covered in the 1 Day Internet Marketing Workshop? * How to get FREE No.1 Ranking in Google in just 5 minutes! internationally, home based entrepreneurs and newbies who wants to start their online business without paying expensive pay-per-click search engine advertising.